Over the last eight decades the architecture department at the Museum of Modern Art made its reputation by promoting avant-garde European and American work, mounting exhibits that defined and championed movements like the International Style, Postmodernism, and Deconstructivism. So MoMA’s new architecture exhibit “Small Scale, Big Change,” which focuses on modestly scaled, community-centered projects around the world, marks a dramatic shift in their mission. It also serves as a potent call to arms. Architects everywhere today are challenged by economic instability and environmental concerns and, at the tail end of modernism, searching for a meaningful, unified language with which to build. The projects at MoMA suggest that the solution isn’t a new set of forms, but a new way to conceive and orchestrate building and infrastructure projects. The eleven projects on display are truly global, and include works in Africa, South America, South Asia, and the Middle East. None was designed by a “starchitect,” and all were implemented in close collaboration with civic and community groups. Most significantly, each project grew out of real practical and social needs. One of the most powerful designs in the show is an American house prototype that costs only twenty thousand dollars. 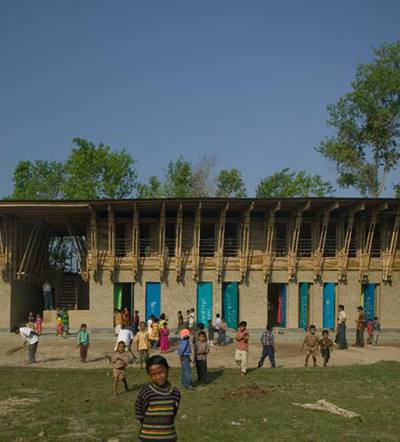 Two other projects, a primary school in Bangladesh and a linear park for Rio de Janeiro, were developed in direct response to community requests.